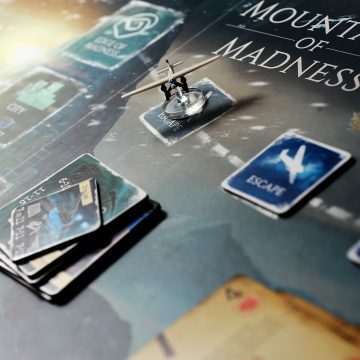 by Nicole H. and David W.
In the vast world of miniatures games, there shines a little light out of Plaid Hat Games onto, the world of family gaming. Back in 2012, they released Mice and Mystics, the adventures of a band of rodents who were actually humans (!) trying to make their way through the scary world of the now giant castle to get to the king and warn him of danger. The way it brought a narrative to life with storytelling made it a really fun and fresh gaming experience. 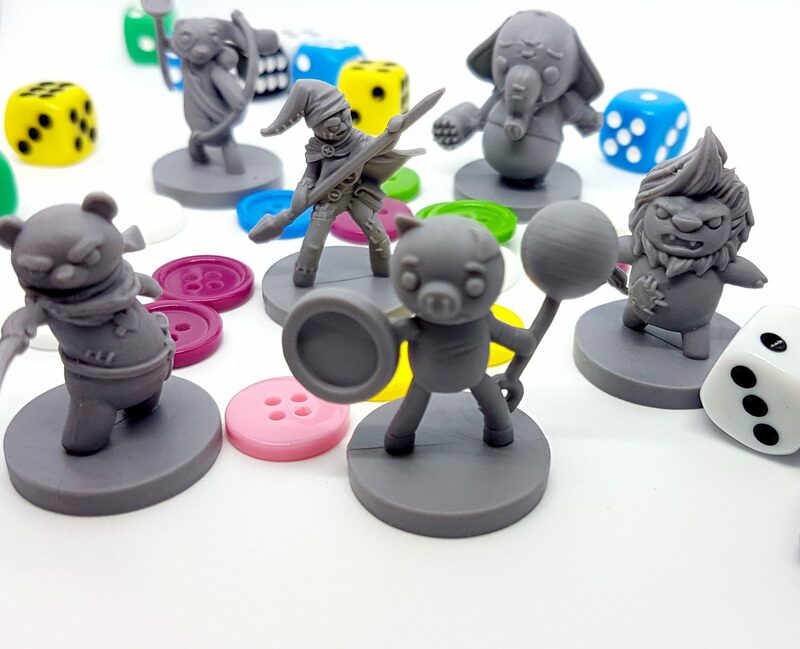 Now, its designer Jerry Hawthorne has brought a whole new realm of storytelling to the table with the adventure storybook game Stuffed Fables. The DWP team have been playing through some adventures as these brave stuffies, and David and Nicole discuss the game and their experience today. Nicole: Whimsical. It’s written all over Stuffed Fables. I wondered if there’d be the stuff (get it?) beyond the whimsy to make this game enjoyable for me. With M&M it was an easy sell, as I’m a huge Mouse Guard fan and it dovetailed nicely into that feel of story. What grabbed me first of all with Stuffed Fables was the look of it – the gorgeous, quality kids book-styled art along with the incredible sculpts caught my eye at BGGcon last year and had me intrigued. David: I actually didn’t know Hawthorne had also done Mice and Mystics, and that is all the more impressive in terms of seeing the changes he’s made to the M&M system. For one, the Storybook system is, I believe an improvement for several reasons: (1) it keeps the scale of the scenarios small and intimate; (2) it allows for a much greater variety of board layouts; (3) it makes it much easier to have branching and/or looping narratives. And the use of black dice for threat-building as well as minion action-choice makes room for a lot more variation in minion behaviour as well as consequences of accumulating threat. That makes for more tension and more unpredictability. Very elegant! 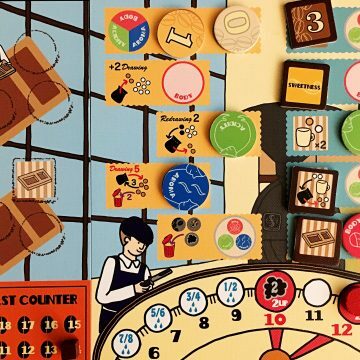 Nicole: We jumped right in, as I’d read through the rulebook to get an overview of the nuts and bolts and buttons of the game. Everything is pretty well laid out and clear, which is great – I think once you start making your moves through the introductory scenario, you sort of see how they all fall into place. Just definitely have a glance through the glossary so you’re aware of the sorts of things that will pop up in various scenarios. David: The rulebook is sixteen pages but a lot of it is illustration and a quick breeze-through is probably enough for experienced players. That being said there are a few little rules you don’t want to miss—mainly around threat—because getting them wrong makes the game way simpler (or harder) than it was meant to be. Nicole: Yes, I did make the mistake of assuming that the minions were the only threat to the stuffies in scenarios. In fact, when there are no minions, threat dice will trigger a “surge” which has a particular tailored response depending on the scenario – I really enjoyed the flexibility this gave each part of the story. Beyond the threat dice, as we’ve both mentioned, the use of dice is far more flexible to drive the story than I’d have thought. I like the use of the different coloured dice for certain actions, and the ability to share a die with one of your fellow players so they’ve got a little extra help on their turn. David: I like how Hawthorne took the “Cheese Wheel” system from Mice & Minions and, just by adding the dice-driven mechanic, added so much more variability and unpredictability to how the game responds to your actions. Nicole: Among all the sorts of things that players can encounter (skill tests, searching for items, meeting lost toys and the like), there are generic minions that will pop up here and there, as well as boss characters that come in each story. They’re all super creepy creatures – some look like a strange toy DNA mishap happened and some look just downright evil. If you can take them down (by hitting them for equal to or more than their defense) you’re doing well – but if they end up triggering and attacking thanks to the threat dice, they can really do some damage. This part of the game requires thinking about stocking up on items that work well with your character, and really coordinating what players will do on their turns. David: That’s another set of rules you don’t want to miss: the ones about minion and boss damage. Nicole: While the storybook provides gorgeous maps and narrative, it also has little fable sidebars at the start of each story to give an overview of an expectations of the morals and general ideals to expect. A bit of a meta-story, I suppose. At the end, once there is a wrap-up piece to your story, there’s also talking points listed to go over what might have been learnt during play. I felt like these were out of place for me, playing it with adult friends; I can see enormous value for playing with kids however, if you’re so inclined to bring them up – and they’re easy enough to skip over. David: Definitely. Speaking as a parent and teacher, you want to be careful not to make the game seem too much like an “educational” game with kids; you run the risk of turning them off! Nicole: I think the subtleties of gameplay and encounters kind of cover the lessons to be learned and motivations to do good nicely, anyhow. This is generally the case with co-operative games, but the fun of banding together in Stuffed Fables to do good and help out is just so charming. Couching these ideas in a kid-friendly narrative and having it be an enjoyable adventure is smart. David: The encouragement mechanic and Encounters with the Lost Toys provide lots of opportunities for players to help each other out. 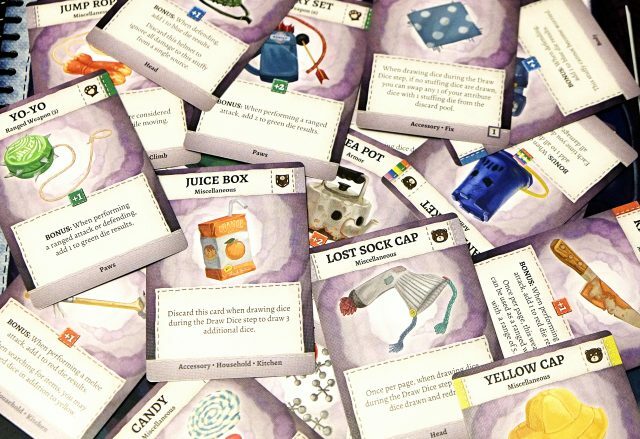 Nicole: So, we’ve had fun with Stuffed Fables – it’s gorgeous, well-written and designed, and has the variety to dive deep for multiple plays. (Seriously, they’re already releasing new stories online!) My only disappointment was not being able to “level up” characters or keep items between games, but I can see why that decision was made. 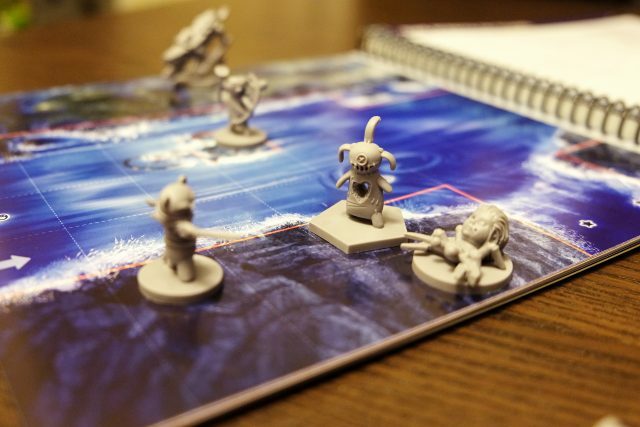 But looking at it overall, is Stuffed Fables a great light strategy/narrative story for anyone, or is it truly something earmarked for family play? 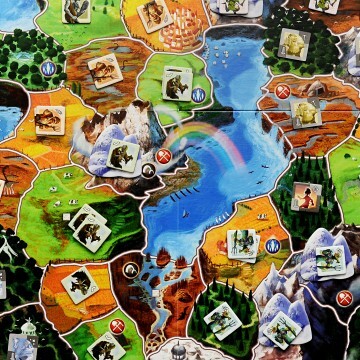 David: Based on our plays it might be a little too unchallenging for serious gamers—it seems very hard to truly “lose” the game, and that lack of risk of real failure might be the game’s only downside. 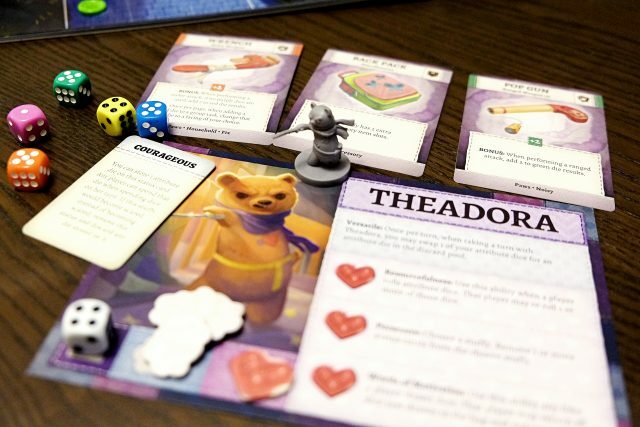 Nicole: Overall, Stuffed Fables provides a solid experience that I’d recommend to any family group looking to try a new co-operative game – especially one that’s sweet, has gorgeous art, a story centered around a little girl, and the ability to play all sorts of anthropomorphized stuffies. With stories that break down into bite-sized scenarios, you can take as little or as much time as you like when sitting down to play, and like any adventuring campaign game you’ll certainly make great memories and have enjoyable experiences along the way. 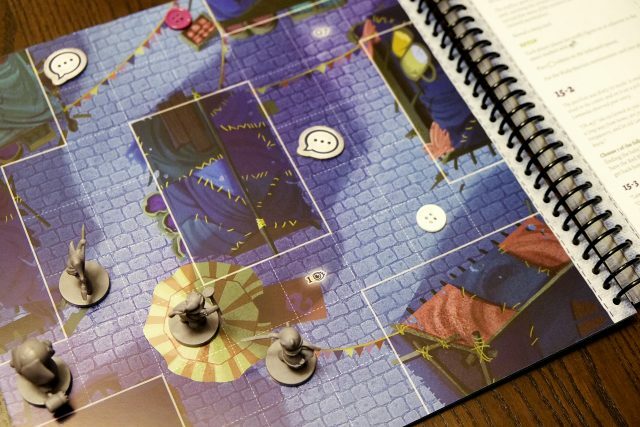 Stuffed Fables is a co-operative storybook adventure game for 2 – 4 players that takes about 45 to 90 minutes to play (dependant on scenario length). Designed by Jerry Hawthorne with art by Regis Demy & Kristen Pauline, it is published by Plaid Hat Games. Thank you for the review copy and letting us experience this adventure, PHG!